The untold story of the post-war battle for Adolf Hitler's giant Volkswagen factory and the Porsche-designed car that became an icon for generations around the globe. The Volkswagen was the showpiece of the achievements of Adolf Hitler's Third Reich. Backed by the Führer himself, it struck fear into the hearts of all who owned and managed Europe's car industry. Designed to "out-Ford Ford", the Beetle would dwarf their efforts with its low price and high production. After World War II what was to be the fate of this odd bug-shaped car and its colossal bomb-battered factory? Legend has it that the victors underestimated the potential of the car that would become the automotive icon of several generations, indeed the world's most-famous and most-produced automobile. Karl Ludvigsen's interviews and researches in British, German, American, Australian and Belgian archives prove the contrary. His hitherto-untold story of why and how they didn't get the factory makes revealing and engrossing reading. History buffs and followers of World War II and its aftermath will relish the way Ludvigsen depicts afresh the creation of the VW by renowned and "untouchable" engineer Ferdinand Porsche, the building of its factory by Hitler crony Robert Ley, "a notorious womanizer who drank too much," and the wartime career of the huge Wolfsburg plant as the prime contractor for the jet-powered V-1 flying bomb, the world's first successful cruise missile. Car enthusiasts who consider themselves well-read will be absorbed by Ludvigsen's disclosures of the national and company mindsets that affected their respective attitudes toward the radical Volkswagen. Most astonishing are his revelations of the deep interest of Ford in the VW factory. Far from rejecting the VW plant, Ford proposed that it be merged with its existing German operations. But the executive charged with the mission (Ludvigsen reveals his identity) failed to follow through. Ludvigsen traces the Beetle's impact on the world of autos, from the Chevrolet Corvair and Hino Contessa to rear-engined Fiats, Skodas and Hillmans. We learn why the most startling decision made by VW chief Heinz Nordhoff was not to change his car's design. And we are brought right up to the 1998 launch of VW's New Beetle. 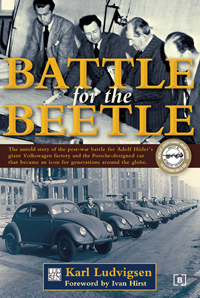 For those who wish to comprehend its amazing impact on the auto market, Battle for the Beetle is the essential source. "Karl Ludvigsen's book on the Beetle history is the only one I know of that starts at the very beginning, going to the source and ending where many, many start - at the beginning of the 'Miracle'. The thorough research behind it makes it a comprehensive document, valuable not for VW people alone, because he covers an important part of our history. I confess that I have learned a lot, quite to my surprise..."
2000 Best Automotive Book of the Year! 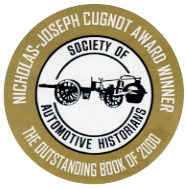 Awarded by the Society of Automotive Historians. 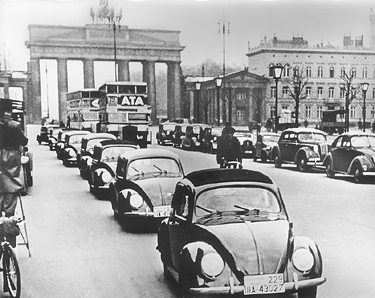 Prototype VWs at the time of the Berlin Auto Show in February 1939. 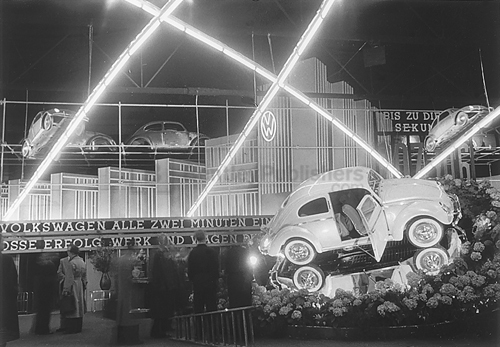 Inside the Frankfurt Show in 1951 Volkswagen erected a spectacular display that used, as its dramatic signature, the distinctive design of its Wolfsburg factory. 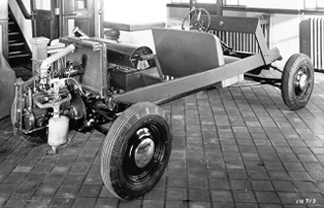 One of several rear-engined prototypes built for Henry Ford. 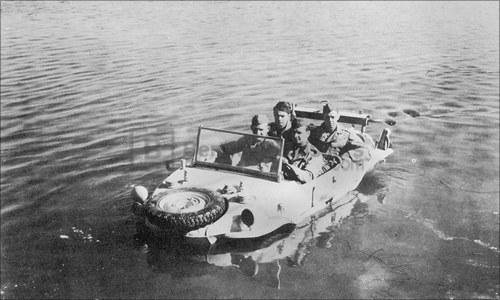 Testing a captured Schwimmwagen at the General Motors Proving Ground.